Amazon had some terrific deals on chromebooks available on Prime Day. Our favorite was definitely the $250 discount on the Google Pixelbook, but Prime Day deals are now behind us (though the Pixelbook is still available at a decent $154 discount). If you’ve been thinking about ditching macOS or Windows in favor of Chrome and you missed out on yesterday’s deals, you might have actually ended up lucking out. Why? 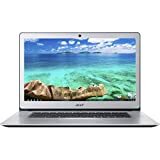 Because Amazon is running a deal of the day on Wednesday that drops the price of an Acer Chromebook 15 refurb to just $225. That’s a killer deal on a chromebook with good specs and a nice big 15.6-inch display, but it’s only available until the end of the day. 15.6 Full HD Display, Intel Pentium N4200, Aluminum Cover, 180 Degree Lay Flat Design.